Comparing Commadaria St John and Commandaria Alasia to Tsiakkas Winery Commandaria. The Tsiakkas Commandaria is a very unusual Cyprus Commandaria, it is golden in colour and has a very delicate aroma. 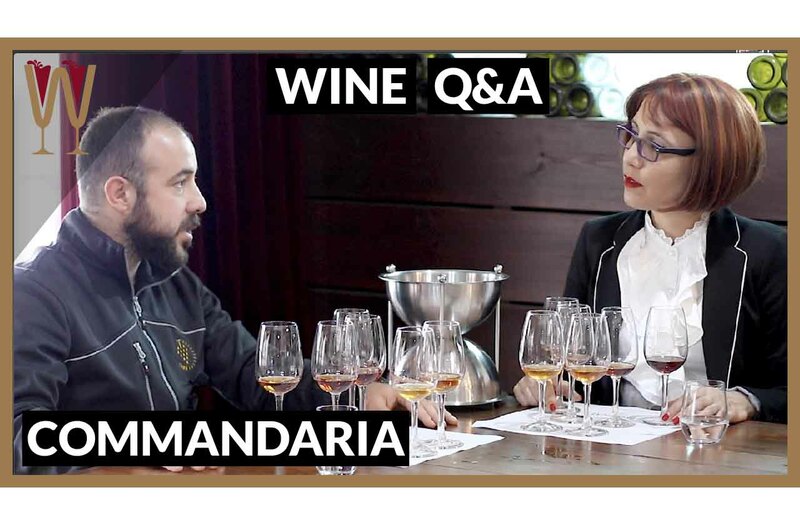 To find out more about this drink, WineScribble goes on a visit to the Tsiakkas Winery tasting room to meet her friend Orestis Tsiakkas and ask some questions about Commandaria Wine. What is involved in making Commandaria Wine? How do the wine makers measure the sugar and alcohol levels? All of the questions are answered. Enjoy the video. Look at how thick and sticky this is. This is a wine from a different time. This is Commandaria, the oldest wine in the world. Traditional Commandaria is a Cypriot wine made popular in medieval times. Look at this, it looks like honey. In its current form and name Commandaria goes back to the 12th century AD when the Crusader Knights Templar made it very popular. In fact the name Commandaria is derived from the headquarters of the Knights Templar in Limassol, known back then as Le Grand Commandarie. It’s right here in Cyprus, it’s 70 kilometers from my house. Here are three examples of Commandaria, I love them all but they are so different. Commandaria St John by KEO and Commandaria Alasia by Loel are very true to the medieval ancestor of this wine. Now, look at this, the future of Commandaria. This tastes like a sophisticated brandy. What’s going on here? This amber jewel by Tsiakkas Winery is a very modern take on Commandaria. Is it true to tradition? It wouldn’t bear the name Commandaria if it wasn’t, but how is it different? I think my friend Orestis Tsiakkas might be able to help me understand this updated Commandaria a little better. Orestis, I think we need to talk. So, what is Commandaria, which wine can we call Commandaria? What’s required? In order to make Commandaria there are a few laws that you have to comply to. First of all in order to make Commandaria, you can make it from two varieties only. Xynisteri and Mavro. It’s one hundred percent of one, a hundred percent of the other, or combination of the two. Xynisteri is a white, it’s the local white variety, and Mavro is the local red. Yes exactly. The most well-known. It has to be made in one of the 14 villages of Commandaria, which these are Zoopigi, Kalo Chorio, Laneia, Agios Mamas and so on and so on. And, it has to be within that area, the grapes they have to come from that area, and it has to be made, vinified, in that area. Then, once you finish the fermentation in the Commandaria region, there is a person coming from the Ministry of Agriculture that takes a sample, to Limassol, where they’re doing a chemical analysis, and there is also a panel of experts and they are doing a tasting blind. And they give you the okay for you to transfer the Commandaria into the winery, or wherever it is, for processing and for ageing. Tsiakkas Winery Commandaria – How is it Different? For us what we are doing here, we are one of the, we’re the only winery basically producing Commandaria from the very beginning. We have our own vineyard in the Commandaria region in Agios Mamas, where we pick the grapes, we take care of the vineyard and so on in collaboration with the vineyard owner. We harvest the grapes we lay them down in the Commandaria region everything has to go there in order to make the Commandaria there ourselves. The grapes need to be dried out in the Sun? Yes, and the difference that we do here in this winery is that we have it onto the beds. They’re higher up so that they give better aeration to them, and because you know if they’re on the ground then it’s not as healthy for the grapes. So this is similar to Amarone? You just stack them up? Yes but in Amarone they control, they are allowed actually to control, the humidity, the air, the everything. Here, it has to be sun dried so everything is dependant on to the, on the weather. How do you know when the grapes have been dried enough? Do you measure the sugar? Yes we do measure the sugar using a density meter. We collect some samples and we check at the level of sugar it has. Is the residual sugar a fixed number? We taste it, we check it and then we decide when to stop the fermentation. But, we are aiming, in this winery, to reach natural sugar of between 13 and a half to 15 percent. The sugars they range, but they’re usually around 200 grams per litre. What is specified by law, is what’s the sugar content level when you’re going to harvest the Commandaria. What’s the sugar content when you’re allowed to crush the Commandaria after the sun drying. That’s fascinating, so there’s a lot of requirements it’s not easy. Absolutely yes, even after when you have the Commandaria, you age it by law for two years or more, and then you have to call someone from the Ministry of Agriculture and get them to come here take a sample, taste it again, do a chemical analysis, then give you the OK, before you can put a label on. And what are they testing? The alcohol, and the volatile acidity of the Commandaria. On average it is about 15%? Yeah, but most Commandarias they’re being fortified. Here we started the tendency of un-fortifying the Commandarias. We do not want to add alcohol spirit to it. How do you get it to look so golden? So this comes basically from the sun drying of grapes. There is this reaction, a chemical reaction, that happens. It’s called the Maillard Reaction and it’s basically a reaction between amino acids and reducing sugar. That causes these browning elements to be formed and have this also caramel effect. Maillard reaction happens everywhere, from baking to cooking. So in effect, it is like the colour of sultanas? Dried sultanas. Yes. OK.
Guys, I had the best time during my visit at Tsiakkas Winery. But I ended up with so much footage I have to actually make two videos. This week’s video is a Q&A about Commandaria and all our questions have been answered. Our first question, is this updated version of Commandaria true to tradition? It absolutely is. It meets every single requirement, the grapes are grown in the Commandaria region, harvested and dried in the Commandaria region, and they are vinified in the Commandaria region. Our second question was how is this wine different? Unlike many traditional Commandarias the Tsiakkas Commandaria is not fortified. Also the Tsiakkas Commandaria is single vintage, not a solera wine. This means that the wine is not blended, the barrels are not topped up. It’s a single vintage wine. And finally, the drying of the grapes. They’re not just put on cloths under the sun. Air circulates because they are put on racks. The grapes dry evenly for the best result. And our final question was: why is this Commandaria this beautiful amber colour, when most Commandarias seem to be a dark mahogany? The answer to this is quite simple, Tsiakkas uses only Xynisteri not Mavro grapes and, Xynisteri being a white grape, it gains this beautiful golden caramel colour, and very delicate aromatics. Cheers tasters! So, what happened to the rest of the footage? I am currently editing Part B of my visit to Tsiakkas Winery. The second video, the vertical tasting of their Commandaria, six vintages that captures the evolution of this beautiful wine. I can’t wait to share it with you. Tasters, if you’ve enjoyed this video don’t forget to give it a thumbs up, don’t forget to share it with a friend. Subscribe, and I’ll see you on the next video!